What Happens to a Pilsner Under the Influence of Oak? The classic pilsner is a wonderfully uncomplicated style of beer beloved for its crisp, refreshing structure and clean balance of hops and malts. The pale, golden lager originally hails from the Czech Republic, and since its inception in the mid-1800s, has found loyal fans around the world. But as often happens in America’s beer landscape, brewers have been tinkering with the classic elements of the style. At places like The Brewer’s Table, Threes Brewing, Hill Farmstead and beyond, brewers are bringing wood into the pilsner equation, experimenting with fermenting the lager in oak foudres and aging in wood barrels, to create a more nuanced take on the style. 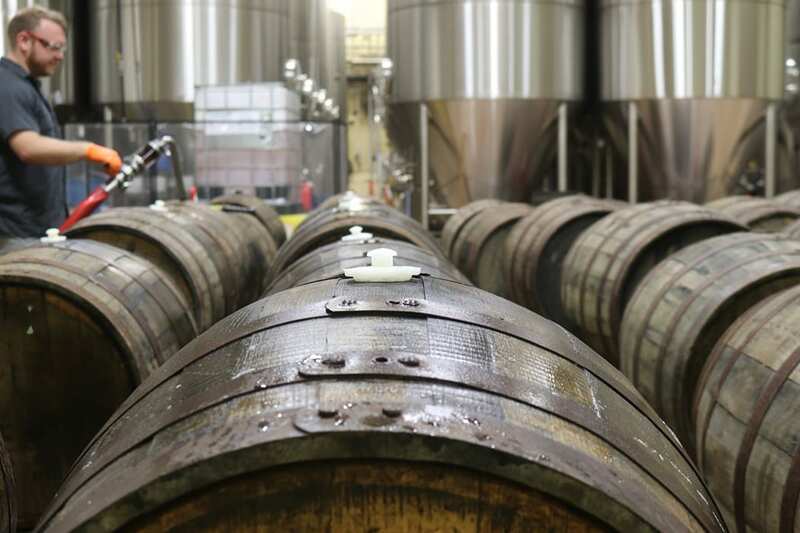 Levy has also experimented with aging lagers in wood barrels, a practice that is currently more common than foudre-fermentation. At Liquid Riot Bottling Co. in Portland, Maine, head brewer Greg Abbot chose to age his pils in a barrel spiked with wild yeast for added interest. Named after the white peaches that flavor the beer, Blushing Star is an American pils that’s fermented in stainless steel tanks before moving to oak barrels, where it’s spiked with Brettanomyces. The funky yeast slowly works its magic for six to nine months before Abbot transfers the beer back to stainless steel with Kelly Orchards peaches for an additional 2-3 months. Once the fruit flavor fully steeps in, the beer heads into the bottle and conditions for another month. “Not an easy one to re-create, but it seemed like a really cool, unusual approach to barrel-aged beer,” he says. The peaches contribute an aroma and flavor that perfectly match the character of the wild yeast. The next batch will be aged in foudre barrels to see what a difference the size and shape of the barrel will make (foudres can hold up to 1,000 liters of liquid). “The goal was to create a pleasant, relatively clean barrel-aged beer to contrast the intensely funky barrel-aged saisons and other Belgian-inspired beers with bold yeast character [that are common in today’s beer world],” Abbot says. Named after a bar in Havana, the Hotel Nacional combines rum, lime and apricot.